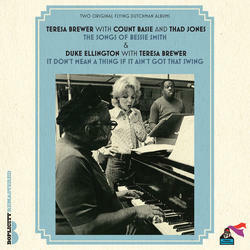 Teresa Brewer was a child star who became one of the biggest pop singers of the 1950s, moving into jazz in the early 70s. These two albums, which hooked her up with the two greatest band leaders: Count Basie and Duke Ellington, are a pleasant surprise and show her to be a natural in this company. They led to a series of LPs showcasing her talents with other jazz greats, but the charm of this pair was never bettered.